Dr. Dabiero grew up in Greensboro, North Carolina, completing his undergraduate studies at the University of North Carolina at Chapel Hill. 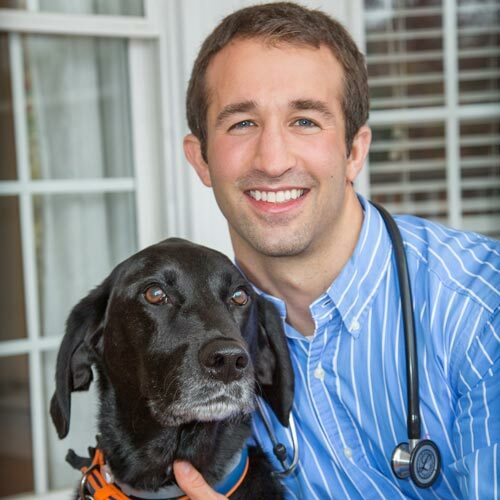 He graduated from Ross University College of Veterinary Medicine in 2013 and finished his clinical studies at Auburn University. In 2015, after practicing in Alabama for two years, he moved back to North Carolina to join HBAH. Dr. Dabiero and his wife, Rebecca, who works as a veterinary oncologist at VSH, live in Cary with two Labrador retrievers named Bentley and Trigger. Dr. Dabiero is an avid outdoor enthusiast whose passions include hiking, fishing, camping, and frequent trips to the dog park. He and Rebecca can often be found fishing together in a cool mountain stream for the perfect trout. His professional interests include ultrasonography and soft tissue surgery.